Available as straight or amphibious floats. These floats were especially designed for LSA and SLSA manufacturers. Option of using a special sealed pull rivet or standard solid rivet. Using the pull rivet will lower about 50% of the building process. Available as a parts kit, as a pre-drilled kit or factory assembled. - Free castering wheel with self centering spring system. - Heavy duty 3/16” aluminum arm moves the wheels up & down. - Grease fittings installed at wheel rotating system and at axle for low wear. - Nose wheel hub is manufactured by Grove, sealed bearings and treated aluminum hub. - Tire is extra large at 9” diameter. - 500x5 heavy duty hub with brakes. - Hub system is anodized A356 aluminum. - Watertight lip seals are used in place of normal felt seals. - Grease retainer installed between wheel halves. 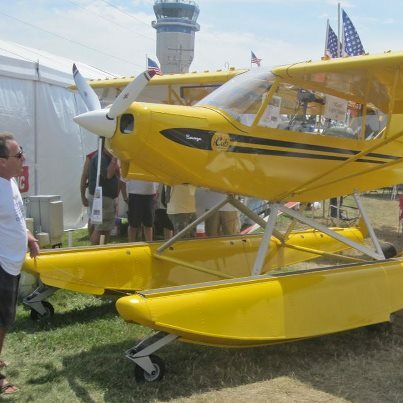 - Tire used is extra large at 14” diameter, making it the best floats for grass strip landings. - Mechanical system locks wheels in the down position and therefore does not stress the hydraulic system on hard landings. - Hydraulic cylinders moves the wheels up & down. - Gear system is connected to 2 bulkheads for extra strength. Bulkheads are 0.032 thick aluminum and reinforced with 1/8” thick extrusions. - Hydraulic system is operated by either an electric hydraulic and/or mechanical pump system. - The compact electric unit is completely self-contained with motor, gear pump, reservoir, internal valving, load hold checks and relief valves. Electric motor uses 20 amp for only a few seconds. - The electrically powered unit weight is about 6 lbs and can be installed just about anywhere in the fuselage which can aid in establishing proper CG position. Power unit is then operated by a 3 way switch mounted on the instrument panel. 2 flexible high pressure nylon type hoses run from the pump to each float. - The mechanical pump has an external hydraulic oil reservoir and does require more time to install. The pump is typically mounted in front of the pilot seat for easy pumping with reservoir in the rear fuselage. Weight is the same as the electric system and same high pressure nylon lines are used. 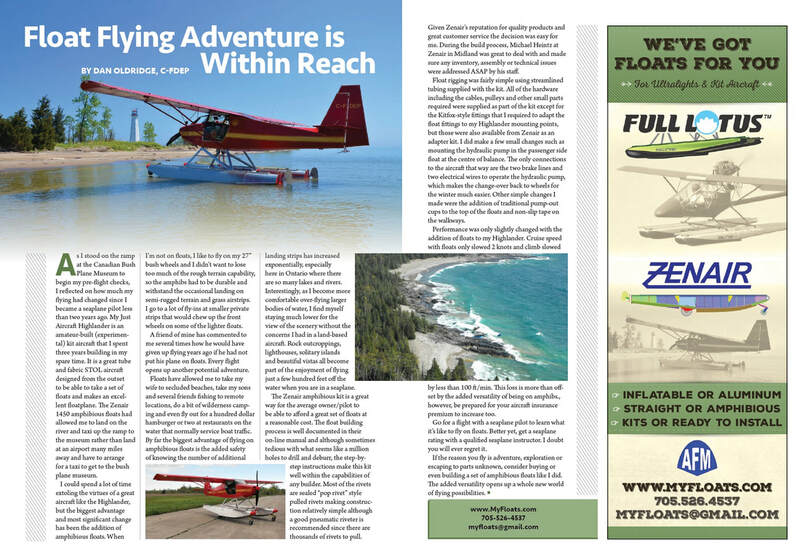 The Zenair #1450 floats above are installed on a 2-seat Highlander kit aircraft. Says the owner: LOTS OF FUN! Two high quality hydraulic units are available. Both are compact and lightweight at about 6 lbs each. The oil tank of the electric unit (left in above photo) is easy to inspect and to fill. Both systems have pressure release valves to make sure that the hydraulic system does not become overloaded. When ordering your floats, specify which unit you want. Electric or Manual pump - you choose! 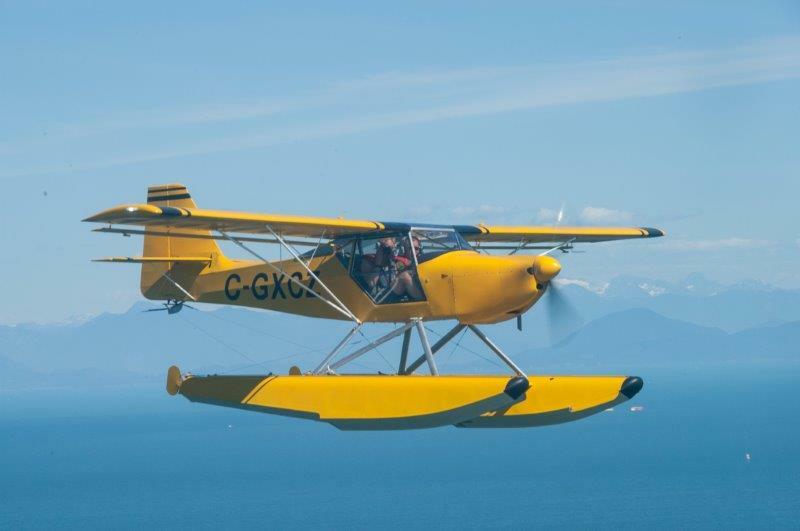 "We just had our 2nd season with the Kitfox 7 on your 1450 floats - cannot get enough of flying with it! ...Regarding the 1450 float size, I cannot see any reason why they would have to be bigger for the Kitfox Super 7 as so far my experience - even at gross weight of 1,550 lbs - was great! Bigger floats would add drag and I am not sure if they would improve anything on the water." Tom in B.C. 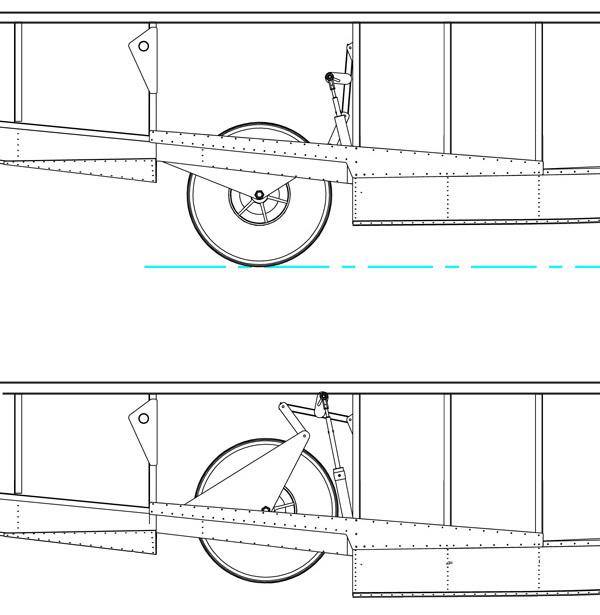 Weights are approximate and includes the wheels/brakes and hydraulics on the floats. Weight does not include Rigging/Spreader bars kit, hydraulic pump mounted in aircraft, paint or other optional equipment. All information is approximate and subject to change without notice.